About 15 years ago, I got a job in Sausalito. Within days, I was eating my lunch on the bay-front rocks while the egrets and pelicans dined on theirs 40 feet away in the San Francisco Bay. I weaved my way through tourists and window shoppers, all of us giddy with the Northern California sun in January. I met the locals in bars and restaurants on Bridgeway. We talked crystal healing and sailing around the world. I got it. I got Sausalito. And I fell in love with the small quirky town that anchored the Golden Gate Bridge’s northern span. Here we are, 15 years later. I’ve moved to a houseboat in Sausalito and have fallen even more in love with my new (again) city. Here are my suggestions for a romantic trip to Sausalito, whether you’re with your sweetie or just falling in love with the city itself. 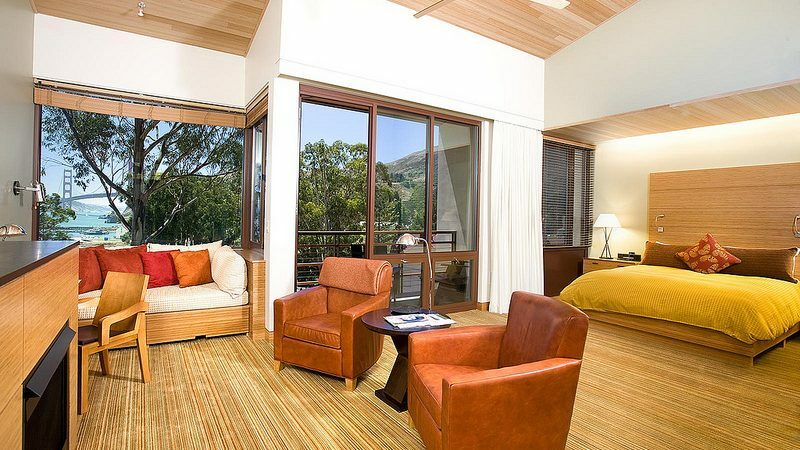 In 2008, Passport Resorts (owner of the world-renowned Post Ranch Inn) opened Cavallo Point, the Lodge at the Golden Gate (601 Murray Circle, from $379 a night). The lodge is about two miles south of the Sausalito ferry terminal, but they offer a complimentary shuttle for guests (reserve in advance). You can also arrive by bicycle, or rent them at the property. The one-mile foray into town is hilly and windy but popular with even the most novice riders. You want romantic and cozy? Stay in the old Fort Baker rooms around the village green. For more modern and luxurious, the newly built rooms a bit farther up the hillside have floor-to-ceiling windows with views overlooking the Golden Gate Bridge and the Bay. Take a stroll along the waterfront or village green itself. Egrets and herons never fail to make an appearance. Cavallo Point’s restaurant, Murray Circle, has won numerous awards for good reason. Farm-fresh produce and freshly caught local crab share headline alongside spectacular views and sumptuous decor in the intimate dining room. And in the cool of the evenings, slide next door to Farley Bar to cozy up in front of the fireplace with a bespoke cocktail. Want to spend an evening cooking alongside your sweetie, or create an offering to throw to in Sausalito’s bay? In the Kitchen (300 Turney Street) leads one-night cooking classes several times a week. Every weekend, choose from daytime or evening classes and get hands-on instruction on pairing local cheeses, cooking comfort dinners, or baking cupcakes. Classes usually last two to three hours (prices vary). Craving a dose of … shipyard in your romantic excursion? Le Garage (85 Liberty Ship Way, Suite 109) should add a little industrial chic. At this steel-and-glass boat garage turned French bistro, locals crowd the indoor and outdoor tables for the weekend brunch and weekday dinners. Start the day right with oeuf a la coque (a soft-boiled egg with truffle butter and local chantarelle mushrooms ), or end a decadent evening with molten lava chocolate cake. Bonus: Since Sausalito is in the “banana belt” of the San Francisco Bay, the outdoor seating here might be 15-20 degrees warmer in summer than similar locales in San Francisco. Inject a bit of seafaring adventure into your romantic Sausalito excursion at Sea Trek (85 Liberty Ship Way). The kayaking and paddleboarding company rents kayaks and boards, but if you want a truly romantic experience, try going on one of their full moon nighttime paddles ($75 per person). Here’s the romantic thing about kayaking a double: You can’t not be in physical agreement. Just trying kayaking with someone out of sync. It can’t be done. The kayak excursions are two to three hours long, so you’ll have plenty of time to practice your togetherness. Fish restaurant (350 Harbor Drive, 331fish.com) exudes Sausalito chic. Sustainable seafood is served alongside organic greens. Cozy up on group picnic tables either inside or, if it’s even remotely warm, outside overlooking the sailboats. If the lines or prices are too big at Fish, the, ahem, quirky Sausalito Seahorse (305 Harbor Drive, sausalitoseahorse.com) bar, nightclub and restaurant is a taste of Marin long forgotten. The colorful Italian owner serves up a Tuscan menu amidst a nautical-themed decor that feels somewhat like you’ve just stepped onto a hippie sailboat from the ’70s. Dance to live music all weekend, including salsa Sundays. Looking for more hotels in Sausalito that can be reached by ferry or bike? Inn Above Tide (30 El Portal), located just across from the ferry dock. (If you were any closer to the water, you’d need Scuba gear!) Every room (from $330) has a view of the Bay, and the upper-end suites come with over-water balconies. Terrestrial Casa Madrona (801 Bridgeway) has been a traveler way-station since 1885. Feel like you’re staying in a beachfront cottage in this hillside hotel, just a few blocks’ walk from the ferry (from $175). Directions. Take the Golden Gate or the Blue and Gold Fleet ferry (a 30-minute ride), or make the journey part of the adventure and bike across the Golden Gate Bridge (check our our guide to best Bay Area bike rentals, and try this guide for routes and other tips). Bikes are allowed on the ferry, so you can bike there and catch a ride back at the end of the day. About the author: Alex Leviton is a travel writer and Lonely Planet author who lives on a houseboat in Sausalito. Alex is also the co-author of the Umbria Slow iPhone app. Discover California is her newest Lonely Planet book.